Picture books are a great way for parents to tackle complex topics like the refugee crisis or the immigrant experience with children. The books in this list can help kids - and the adults reading to them - better understand, and empathize with, the immigrant experience. Emma Lazarus was raised in a wealthy Jewish American family in 1880’s New York City, where she was moved by the plight of immigrants. As a young woman, asked to write a poem to raise money for a pedestal for the proposed Statue of Liberty, she composed “The New Colossus” and so became the voice of the Statue of Liberty. A beautiful story about a child who wonders whether they need a new name. While many children will relate to this story, it also inspires empathy and encourages inclusion. Fair warning, you'll likely get teary eyed while reading this, so give it a practice read before you sit down with your kid. This book follows Cartwheel, a young girl from Sudan, as she resettles in Australia, and grapples with the transition of adjusting to a new culture, new language, and finding new friends. This gorgeous book is better suited for older readers and kids who can handle heavier topics like loss and death. The story follows a young refugee and her family as they are faced with making near impossible decisions as they escape their war-torn country. 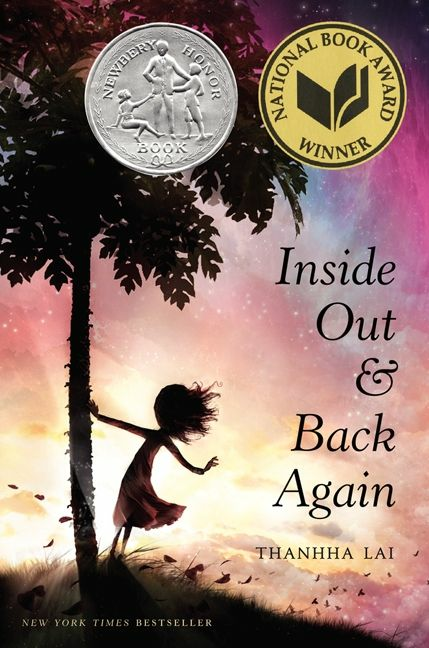 A wonderful coming of age story based on the author's own life, Inside Out and Back Again follows Ha as she settles in Alabama after the fall of Saigon. A little boy, Jose, and his father, must drive to visit his mother in a women's shelter after she is deported. This book highlights the real life struggles of immigrant families and the consequences of deportation in an easy to understand and very age-appropriate manner. Recommended for kindergarten and up. This graphic novel follows the story of comic book artist Lily Renee Wilhelm as she escapes Nazi occupation to make a new life in America. This is a good read for tweens and comic book fans. This one is a heavy hitter, but in a good way. The book deftly tackles immigration, refugee resettlment, bullying, and tolerance, in an easy to manage, relatable way for elementary school students. The subject matter may be weighty, but the story is uplifting. An adorable story about an artisan who crafts the carousel horses on Coney Island. As Feivel works to save money to bring his family to America, he incorporates details about his loved ones into his wood carvings. A lively story great for kids ages four and up. This rhyming book for younger children is super cute and includes a pop-up suitcase for kids to do an activity inspired by the book. Children are invited to think about what they would bring if they had to move and could only pack one suitcase. I read this to my nephew and his answer was "socks." Just socks. If you're not yet familiar with Polacco's work, this is an awesome introduction. The prolific author/illustrator has written several books about immigration and refugee stories. This particular book focuses on one family's story and the special tea cup that connects the generations. This is a really wonderful book to help young children, like preschoolers, understand what it means to be settling in a new place. The water color illustrations are incredibly beautiful as well. A little boy adjusts to life in West Virginia. He misses home and worries about the way the move has affected his grandmother and little sister. Watts pretty deftly conveys what it feels like to be a kid adjusting to life in a totally new and alien place, but it's Yum's illustrations that really make this book special - conveying the emotional weight of the experience in ways that will sit with both children and adults readers. This allegory follows a lone boy as he journeys across the ocean in search of a new home. He clutches a teacup filled with soil from his birth place in his hand. The book is beautifully illustrated and a solid read for kids ages 6-8.